It's been a melty week in Prior Lake, Minnesota. 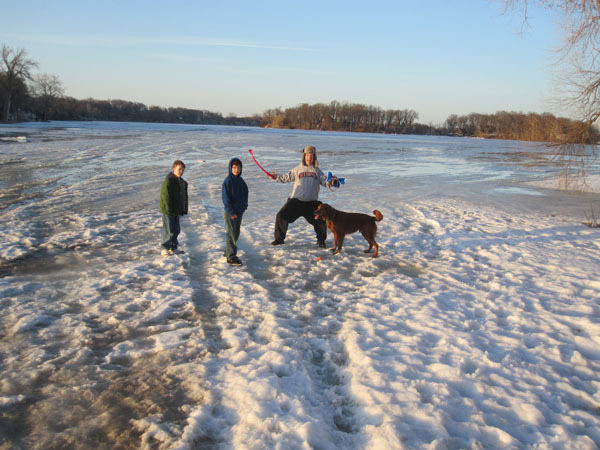 I know most of you in the rest of the country have been enjoying real Spring weather, but here in Minnesota we still have a lot of snow on the ground and ice on the lakes. So since the temperature reached the fifties, we were all excited to get outside and finally start enjoying some fresh air again. And wet feet! 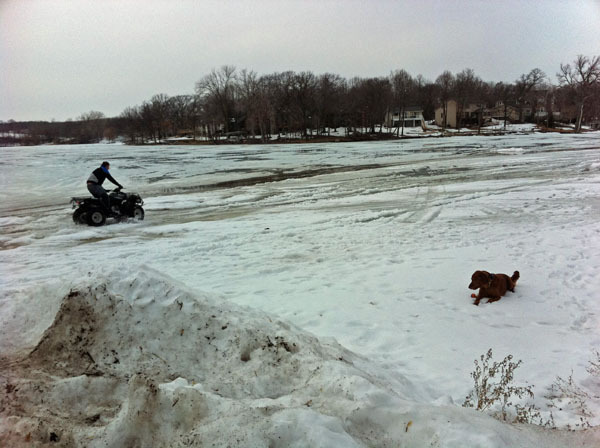 When it's almost sixty degrees outside, we're willing to walk on the frozen lake, but plenty of people are willing to go out there in a motorized way. I sit back and admire their bravery. 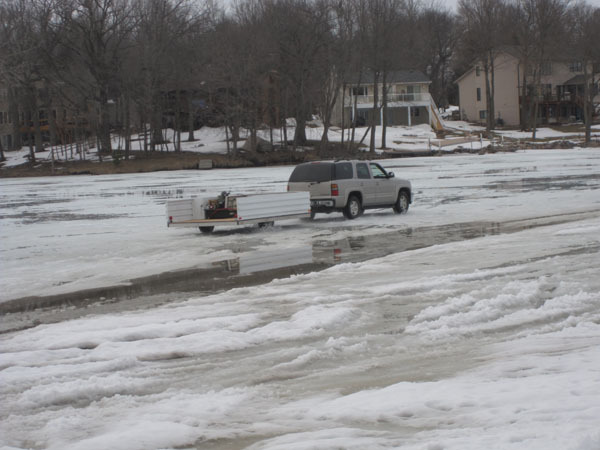 Four wheelers are one thing, but seeing people drive their trucks through deep puddles of water sitting on a layer of ice that resides on top of 20 feet of water below is surreal to me. 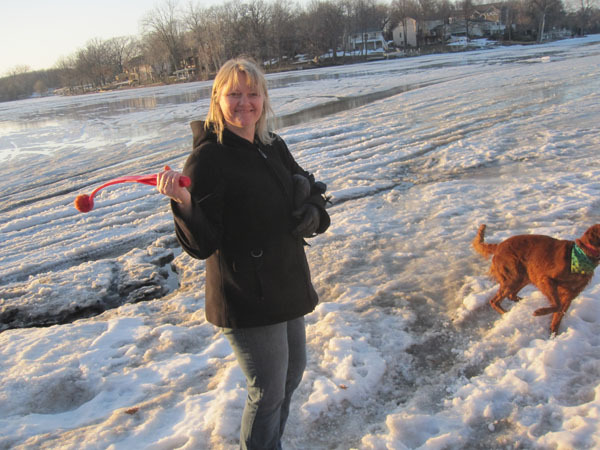 Sometimes I talk to people who do it and they'll say things like "Do you know how thick that ice still is? Plenty enough to hold a vehicle!" So then I think they're smart and I must just be paranoid. But then I read in the newspaper every year about people that put their vehicles through the ice and I'll think they're not smart. It's confusing. I don't know the right answer, but I guess I'd rather just not risk it. Miss Sheri sure knows how to sling balls! Miss Sheri sure knows how to sling other stuff also. 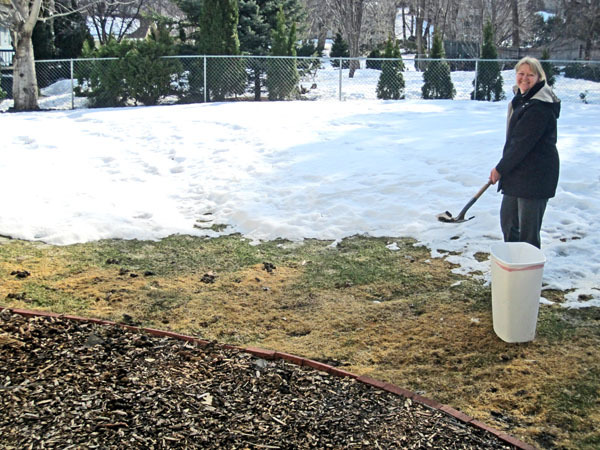 It's amazing how much poop can be covered up by 6 months worth of snow! 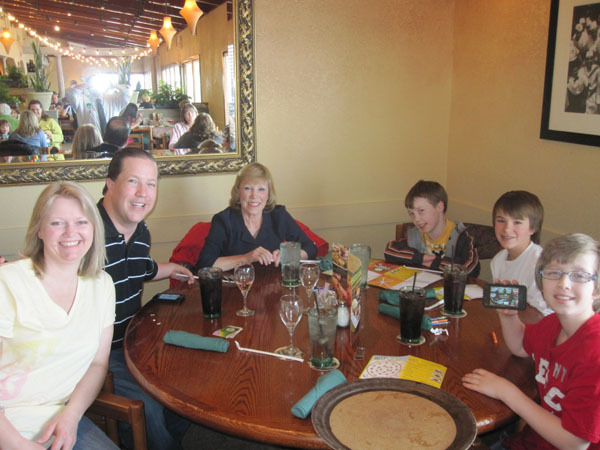 On Saturday, we hooked up with our old buddies, Chris Curry and Grandma Linda for a visit to the Olive Garden. The restaurant people sat us in the corner. Apparently we get kind of loud and are slightly annoying to sit nearby while other customers try to enjoy their succulent Italian cousine. I think we're kind of fun to be around but I guess Opinions Vary. 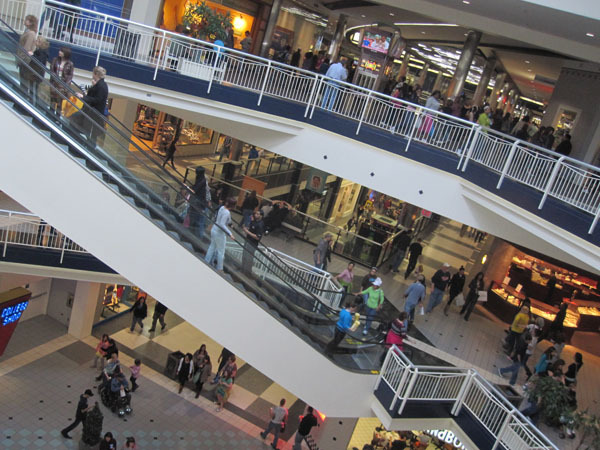 That afternoon, we went to the Mall of America. There sure were a dang lot of people there again! 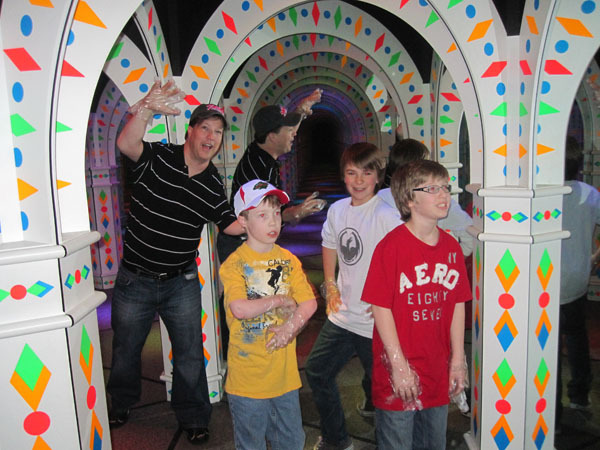 The purpose for our visit was to check out the Amazing Mirror Maze. 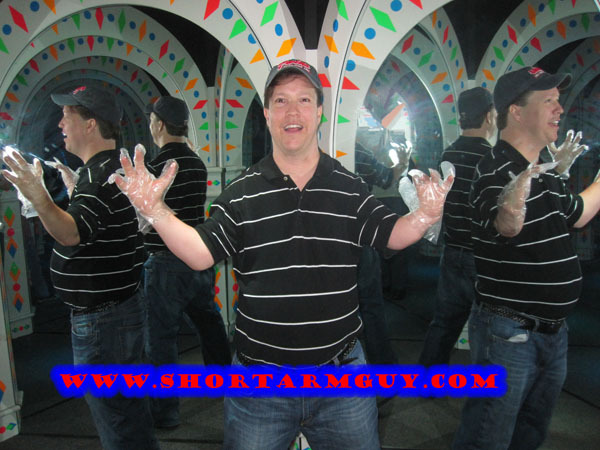 Their website says that at 2,500 square feet, it is one of the largest mirror mazes in the world, with endless hallways, infinite reflections, and a new twist and turn waiting around every corner. I wasn't sure if we'd enjoy it or not, but honestly it was pretty cool. 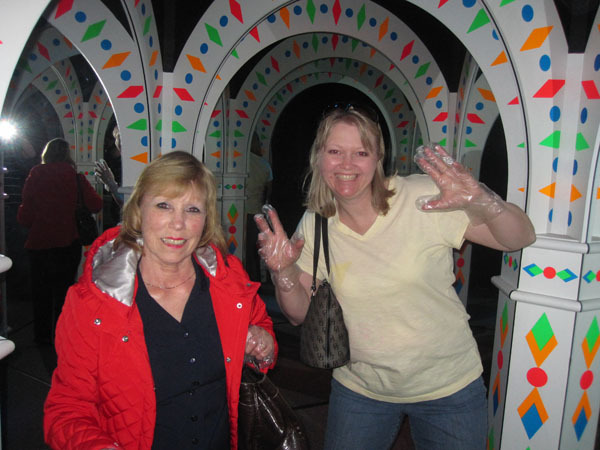 They make you wear plastic gloves so you don't smudge the mirrors when you walk into them, which you do quite often. Another weird side effect is how many times you think you're looking at a real person, when in fact you're looking at their reflection. Or quite possibly, a reflection of their reflection. If you're prone to anxiety attacks, it may not be a good place to visit because you can quickly start to feel lost and the exit isn't always easy to find. At $7.95 per person, I can't imagine it's a place we'd visit again, but we all thought it was a pretty cool thing to do once. Check it out if you get the chance. Miss Sheri had fun with the gloves mainly because she didn't have to smell her hands any more. Apparently, there was still some remaining poop residue under her fingernails from the grimy backyard cleaning task earlier that day. We were happy to see her smile again. Grandma Linda's smile didn't last long while we were there, though. The mirrors really started to stress her out after being in there for 10 minutes or so. She didn't say anything regarding a reason why, but I think she can see strange people on the other side of the looking glass that none of the rest of us can see. Sorry about that, mom.